Fits Chrysler and AMC A727 and A904 automatic transmissions with a reverse valve body, also fits Ford, Lincoln and Mercury C4 and C6 automatic transmissions with a reverse valve body. The Quarter Stick shifter provides positive gear change control for both street and race applications. Its compact size fits easily in racecars with limited space and is very lightweight at only 2.5 pounds. Features include black oxide coated steel construction, 1018 hardened steel gate plate, forged aluminum shift stick with 7/16-20 tpi and a classic white Hurst shift knob. 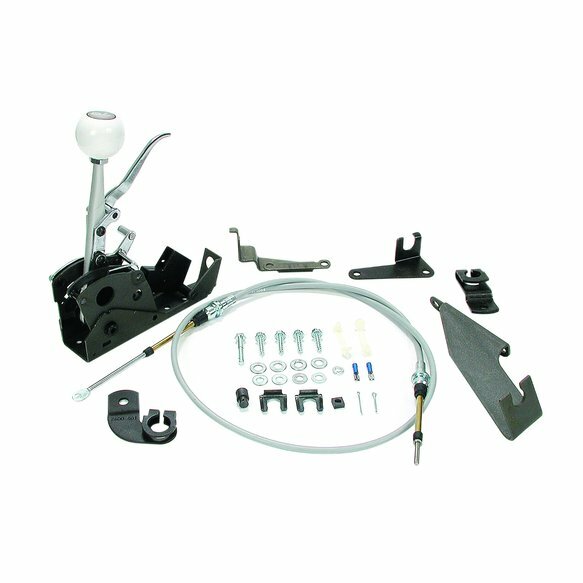 Other features include factory installed neutral safety switch, chrome-plated trigger, and a spring-loaded reverse Loc/Out mechanism that complies with NHRA/IHRA safety rules. Includes all necessary hardware, a 5-foot long shifter cable, and complete installation instructions. Note: Optional aluminum mounting bracket, backup light switch and lightweight aluminum or plastic shifter covers available separately.